Subscribe to Kosher Like Me weekly newsletter so you won't miss a thing. We promise that it's painless and we'll NEVER share your info. I think everything is better in mini, especially enticing holiday desserts that are better eaten in controlled portions. Shavuot desserts, laden and rich with creamy cheese, are almost impossible to resist, though. 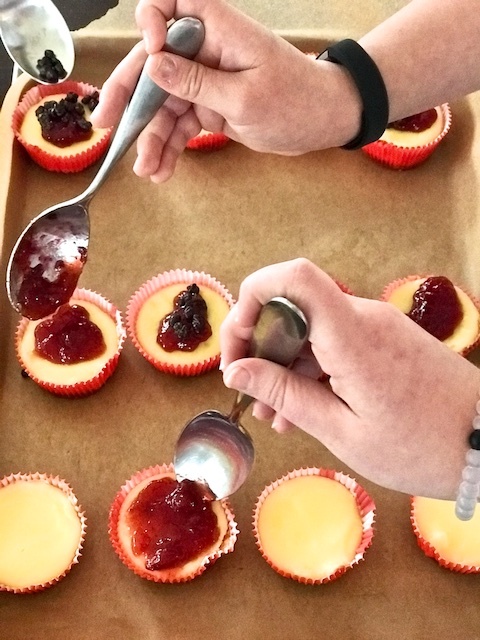 I really understood how tantalizing mini cheesecakes are when I taught an animated group of tweens how to make these mouthwatering bites during a class recently. I proudly confess that none of us ate just one bite. Cheese cake, dairy kugels (puddings), blintzes, bourekas and anything with dairy, in fact, has long been a tradition on the Shavuot table. Some attribute the custom of eating dairy to the reference of Israel as the Land of Milk and Honey. Some prefer to link dairy to this joyful holiday when we received our Torah, including the complex laws of keeping kosher. If that’s the case, then dairy was a safe bet since there wasn’t time to celebrate with a meal that complied with kosher laws in between receiving the commandments and prepping the feast. It strikes me as a very Kosher Like Me choice, really. For other dairy recipes for your Shavuot table scroll up to the HOLIDAYS tab and click on Shavuot. You’ll find kugels, bourekas, phyllo pie, OH MY! There are lots of great variations on the cheesecake theme: pumpkin, oreo, red velvet, maple/ginger, and my second place favorite chocolate cheesecake brownies. Still, no matter how I admire these other versions, I am a cream cheese cake traditionalist. As I landed on a classic version to teach to my trio of twelve year olds, I went with a dense cream cheese cake, the kind we love in NYC. Because it was way before berry season, we topped these creamy bites with a variety of jams. If you make these luscious minis in the summer, be sure to use the best freshly harvested strawberries and blueberries you can find. Shavuot is celebrated from 9:00 EST on May 19- 9:00 PM on May 21, 2018. Happy Holiday to all. And to those who don’t celebrate, find some friends who do and enjoy their cheesecakes. This recipe is adapted from one of the first cookbooks my Mom gave me right after I got married. It took me at least five years to unpack the food processor I had received as a wedding gift but once I did, I fell hard for the convenience and yes, pleasure of using my processor. I taught this recipe to my favorite trio of tweens this past winter with the intention of getting them comfortable with this essential kitchen tool. Turns out that the biggest challenge was how to share the creamy batter when we went to lick the bowl clean. This recipe is a simple classic that hasn't needed much adjustment since it was first published over 35 years ago. Insert steel knife (S blade) into processor. Break wafers into chunks by hand. Process until coarse crumbs are formed. Add remaining crust ingredients and process until blended, about 5 seconds. Line cupcake tin with paper cupcake liners. Divide crumb mixture evenly into lined tin and press into bottom. Wash and dry processor bowl and blade for next step. Place all ingredients for filling into processor bowl and blend until creamy, about 30 seconds. 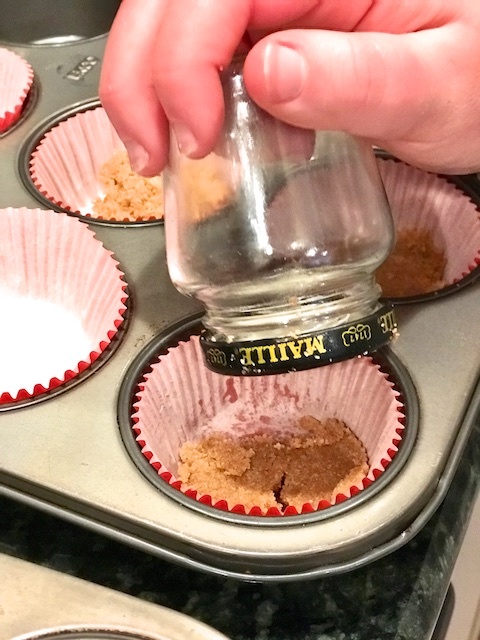 Using a cookie or ice cream scooper, divide filling evenly into cupcake tin. Bake at 375 degrees, F for about 10 minutes or until edges are brown and set. Allow to cool and remove from tins. Top with a spoonful of cherry, blueberry or strawberry jam. When fresh strawberries are in season, slice berries in half and create a fun pattern on each mini cheesecake. Melt 1 cup of strawberry or apricot preserves with 2 tsp. water over low heat. Brush gently over fresh fruit to glaze. Chill 3-4 hours. I’m going to try these with gf graham crackers! Thank Liz! Are you crazy about tahini, halvah and all of the variations and new creations popping up? Not a tahini-phile yet? You will be after this event. Join Gabriella Gershenson in conversation with sesame mavens Rachel Simons of Seed+Mill, NYC, culinary journalist and researcher Ronit Vered, and Richard Radutzsky, owner of Joyva, as they explore the wide world of tahini, halvah and all of the sweet and savory bites in-between. Join Jamaican co-authors and sisters, Michelle and Suzanne Rousseau, in conversation with Cherry Bombe‘s Kerry Diamond as they discuss Provisions: The Roots of Caribbean Cooking- 150 Vegetarian Recipes. Together, they’ll explore the fascinating history of the region and the women, in particular, who have been responsible for farming, preparing and selling their native cuisines for centuries. Vegetarian nibbles and noshes will be served. Join Jackie Topol, MS, RD, Nutritionist, in preparing nourishing dishes that will set you on the right path to achieving your 2019 health goals. Sunday, 1/13/19; 11 AM-1:30 PM; $95. This is a hands-on class in a kosher kitchen. Menu may include: curried carrot soup, skinny kale Caesar salad, cauliflower “fried rice”, chickpea pasta with creamy pumpkin sage sauce, banana chocolate chip superfood cookies. Elevate your Chanukah celebrations after learning to prepare 8 recipes from around the world in this hands-on cooking class taught by Chef Jennifer Abadi at JCC Manhattan. and MORE! For more deets and to register for class, click here. Chefs Jeffrey Yoskowitz and Liz Alpern, co-founders of The Gefilteria, and co-authors of the cookbook, The Gefilte Manifesto: New Recipes for Old World Jewish Foods, will produce 2 dinners exploring the varied flavors and stories of contemporary Polish cuisine stemming from the country’s diverse culinary roots. The first dinner, a Friday night Shabbat at Archestratus Books + Food on November 2nd, explores the Jewish-Polish culinary legacy in the warm, communal atmosphere of a Shabbat meal. The second dinner, on Sunday, November 4th at Cherry Point, a Greenpoint restaurant, will present traditional Polish cuisine through a modern lens. Meals will be kosher style. Dietary requests may be made upon registration. Hankering to host an authentic Chinese dim sum brunch? Learn to make juicy dumplings and other dim sum favorites with Chef Shaya Klechevsky at Marlene Meyerson JCC in Manahattan. This class is kosher and meat. click here for more info and to buy tickets. Liz Rueven (that’s me! ), CT food blogger, recipe writer and cooking instructor at www.kosherlikeme.com, will present a pre-Rosh haShanah demo and tasting using Savannah Bee Company‘s honey as a distinctive ingredient in four holiday dishes. We’ll explore how to combine symbolic ingredients in contemporary recipes that highlight seasonal, local and creative combinations. TO REGISTER call Julie: 203-557-6878 OR email: julie@savannahbee.com and use REGISTER in the subject line. Celebrate the bounty of the late summer harvest by learning to can safely with Chef Jen Cinclair. Sample recipes for simple appetizers utilizing class-made batches of berry jam, herbed tomatoes, and a quick vegetable pickle. You’ll leave with a jar of each. Join Middle Eastern food expert, Jennifer Abadi (author of Too Good To Passover), as she teaches this hands-on cooking class that will elevate and inspire your picnic outings. Israeli dried fruit salad with grapes, almonds, mint, and honey. NOTE: This class is taught in a kosher kitchen. Take an international culinary journey as Chef Jennifer Abadi teaches us how to prepare summer salads you’ll enjoy all summer. This is a hands-on class in a kosher kitchen. Enjoy the fruits of your labor with your classmates at end of the evening. Looking to add more vegetarian dishes to your repertoire? Join Chef Kim Pistone in her Creative Vegetarian Cooking class! This vegetarian class may include escarole, bean, and barley soup; Mediterranean galette filled with oven-roasted zucchini, red onion, tomatoes, and asparagus; baked sweet potato wedges served with ginger crème fraiche; insalata mista; corn bread; and baked phyllo filled with apples, honey, and cinnamon. Prep and cook with your classmates and then enjoy a late dinner together. Join two time James Beard award winning chef, Alon Shaya, as he shares his personal story and culinary journey from Tel Aviv – Philadelphia-Milano and Bergamo and finally to New Orleans. Noshes from his recently released memoir and cookbook will be served. Have you tasted seasonal, artisanal gefilte fish yet?! Here’s your chance! Join Liz Alpern and Jeffrey Yoskowitz, co-authors of THE GEFILTE MANIFESTO:NEW RECIPES FOR OLD WORLD FOODS and co-founders of The Gefilteria, as they explore everything you never knew about gefilte fish and how they serve it in ways that reflect today’s tastes. Leah Koenig, author of MODERN JEWISH COOKING and LITTLE BOOK OF JEWISH APPETIZERS , will join them in conversation as food journalist, Gabriella Gershenson, moderates. After hearing this power panel chat about Jewish foods past and present, you’ll likely join their Ashkenazi cuisine revolution. Noshes and book sales will follow the talk. How was German-Jewish Cuisine Unique? Join mother-daughter team Gabrielle Rossmer Gropman and Sonya Gropman, authors of The German-Jewish Cookbook; Recipes and History of a Cuisine, in convo with pioneering food writer Mimi Sheraton as they explore German Jewish cuisine as it existed before WWII. Learn how these recipes were adapted by Jewish refuges after the war and how this region’s food differs from more familiar Jewish cuisines. Distinctive German HAMANS will be discussed and available for noshing as we approach Purim. Passover dishes from the book will be discussed, too. For more info and to buy tickets click here. Join Jennifer Abadi, author of A Fistful of Lentils: Syrian-Jewish Recipes From Grandma Fritzie’s Kitchen, to learn the basics (and secrets)of her family’s delicious recipes. Using classic Syrian ingredients such as tamarind, bulgur wheat, sour cherries, allspice, and cinnamon, you will walk away from class understanding why Aleppoan cooking from the Levant is considered among the best Middle Eastern cooking in the world. Menu may include schraab el temerhendy (tart tamarind “iced tea”); burghol (bulgur wheat spread with cumin, tomatoes, and tamarind); riz (Syrian rice with fried onions and pine nuts); fibbeh m’gerraz (meatballs with sour cherries and tomato paste); and beddah b’bandoorah (tomato stew with olives, cumin, and whole eggs). This class is taught in a kosher kitchen and includes meat. Paula Shoyer, author of The Healthy Jewish Kitchen, shares her spin on healthier versions of Jewish classics. Forget the frying, margarine & frozen puff pastries. Instead, you’ll find 60 plus recipes for nutrient-dense Sephardic and Ashkenazy dishes updated for today’s health conscious home cooks. Join Paula for a chat and some noshes. We’ll be there, too! Enjoy deli classics like stuffed cabbage, chicken-in-the-pot, potato knishes, pastrami, pickles, and more as Ben’s Deli chefs discuss the history and culture of Jewish delis in NYC and around the U.S.
Joel Chasnoff presents Christmas eve for the Jews with special guests Jessica Kirson, Phil Hanley and others, TBA. Can you think of something better to do? Doors open at 6 PM. Click here for menu. Laughs begin at 8 PM. Click here for tix. Ready to heat up your kitchen this winter? Explore exotic Indian spice blends and ingredients in this hands-on cooking class at JCC in NYC with Chef Jennifer Abadi. green mango salad, coconut rice, spicy cauliflower, fried fish with tamarind and chickpea flour macaroons flavored with cardamom. For more information on this exciting menu and to register click here. This class will be taught in a kosher kitchen. What does it take to go from a Polish shtetle to NYC’s favorite Jewish culinary institution? What does HOME mean in the context of Jewish food traditions? JDC ambassadors and friends invite you to explore the story with 4th generation Russ and Daughters co-owners and cousins, Nikki Russ Federman and Josh Russ Tupper. Join us as we hear the Russ family’s fascinating history as we enjoy the classics at Russ and Daughters at The Jewish Museum, NYC. Nosh on gravlax tea sammies, pickled herring canapes, pastrami cured smoked salmon and more. This is a kosher event. Chef Shaya Klechevsky will teach how to create dishes that may include zucchini keftedes with feta and dill; stuffed grape leaves with bulgur and mint; tzatziki (a classic Greek yogurt with cucumbers and dill); chickpea confit; grilled branzino with ladolemono (Greek-style sauce); red snapper baked in grape leaves; and a date tart. This class is taught in a kosher kitchen. Learn to make a variety of small dishes in the tradition of Chinese dim sum with Chef Shaya Klechevsky. Menu may include beef edamame shumai dumplings; vegetable egg rolls; roast chicken and shiitake steamed buns; scallion-sesame pancakes; and sweet egg custard tartlets. This class is taught in a kosher kitchen and may include meat and chicken. Join Chef Jennifer Abadi as she pairs peak of harvest ingredients with Middle Eastern flavors for this hands-on vegetarian cooking class at the JCC, NYC. Menu may include Syrian crushed wheat “caviar”, Libyan sweet and spicy pumpkin dip, Syrian stuffed cabbage, traditional Moroccan phyllo pastries and more. Just on time for Rosh HaShanah! We’re co-hosting an artisanal honey tasting with Marina at Red Bee Apiary in CT. The honey barn will be styled especially for this celebration by Lauren Kreter of Borrowed, a vintage inspired company. Honey for all of your holiday needs, recipes, gift boxes, beeswax candles, vintage tableware and more…. Red Bee Apiary, Weston, CT.
Summertime is a great time for travel and eating as you go. If you’re in NYC, Chef Jennifer Abadi leads fascinating Jewish food tours of the Lower East Side of NYC. Think you know it all? I promise, you don’t! Read where we noshed and what we learned here. Register for group tours or set up your own group here. Note: There will be 1-2 stops at places that are not strictly kosher. For anyone kosherlikeme, you will have plenty to nosh on. This year’s street fair celebrates the contributions immigrants have made and continue to make to Jewish cuisine and New York’s food scene. Nosh your way along Sixth Ave. between 48-49th Streets, enjoy Klezmer tunes, cooking demos and a healthy dose of Yiddish. Dads: Stop by the Workmen’s Circle stand for free pickle pop or egg cream! For more info and a list of vendors, presenters and activities click here. We’ll have plenty of great eats with food trucks and local vendors providing the noshes. Kosher and vegan choices will be available. Breakout sessions including cooking demos and discussions on the intersection of sustainability and Jewish food values. Kids’ activities include the famous Topsy Turvy Bus! Register in advance to save your place in breakout sessions you won’t want to miss. join us in making this festival a ZERO WASTE event. Farm to table thought leader, Dan Barber joins food writer/editor/critic Ruth Reichl in convo with James Beard award winning author, Michael Ruhlman. They’ll be dishing about where our food comes from, how it’s marketed, what is actually good for us and how to be more informed consumers. Let me know if you’d like to join me. I’ll be there! It’s NOT too early to think about Hazon Food Conference Aug. 9-13, 2017. Whether you want to expand your culinary expertise, experience the pleasure of harvesting your own organic fruits and veggies, unpack the complexities of our global food system, or connect to our ancient food tradition, there is something for everybody at the Hazon Food Conference. The Kids’ Food Conference, specially designed for young foodies ages 5-12, makes it perfect for the whole family! Use code MATZAH100 before April 14th to get $100 off each adult registration, or code FIRSTFRUITS75 before Shavuot, June 2nd to get $75 off each adult registration. Joan Nathan, James Beard Award winning author and authority on global Jewish foods, will join Mark Russ Federman (Russ and Daughters, NYC) in conversation about Nathan’s just published cookbook, King Solomon’s Table. This anthology of over 170 recipes spans the millennia and the globe with both classics and new riffs on traditions. This remarkable collection takes the reader and home cook from India to France, Italy to Mexico, through the Middle East and North America with historical details, personal histories and mouth watering recipes. Click here for more info and to purchase tix. NOSH BERLIN is Berlin’s first ever Jewish food week! Presenters from the USA, Canada, across Europe and Israel will come together to share their knowledge, skills and delicious eats with attendees. Classes, demos, chef talks, markets, readings and films will be presented at many venues across the city. For more info and a listing of events click here. Sniff, swirl, taste and savor as you learn to pair diverse wines with dark chocolates. Learn why some matches are so perfect together as you gain a deeper understanding of how and when to serve them. Pickles Lovers: This Workshop is for YOU! If you’d love to learn how to preserve fresh veggies for that perfect bite of pickle heaven, this workshop is for you! Three restauranteurs express their passion for this super food and ancient staple of the Middle East in HUMMUS! THE MOVIE, winner of 10 international film awards. Hummus! The Movie is a Jerusalem University film that incorporates everything from the Guinness World Record for “The World’s Largest Serving of Hummus,” to a French Benedictine Monk of a mission to find the world’s tastiest chickpeas, to a hip hop musician convinced of the geopolitical power of the meal in a masterful compilation that has won 10 international film awards. click here for more info and tix. The historic and beautiful SCHOOLHOUSE restaurant in Wilton, CT is launching their mid-winter vegetarian dinners again. Hallelujah! Owner, Chef Time LaBant sources from area farms and wows his guests with big flavors derived from ingredients that are grown by his neighbors. Diners are known to travel far to arrive at this charming spot along the Norwalk River. We wait for this all year! To read our review click here. Dinners are prix fix at $48.00 pp excluding tax and gratuity. Vegetarian dinners will be offered each Wednesday eve between January 18- February 22, 2017. Be sure to reserve early. Tip for Manhattanites: MetroNorth trains run right into Cannondale, CT. The restaurant is just steps from the charming station. There’s more to do on December 25 than eat Chinese food! Join Ron and Leetal Arazi, of NY SHUK, as they teach the secrets of making the flavor packed Tunisian sandwich specialty called Fricasee. ⋅ how to chop a proper Israeli salad and assemble all of the other essential components of this popular Israeli street food. Light the menorah and celebrate your new skills together as you eat this deep fried Chanukah treat. plus (count ’em) four more! The Annual JDC Symposium explores some of the most challenging global regions for Jews around the world. Visit compelling moments of Jewish history in the DP Camps, trace your own roots with JDC, and explore the intertwining of Jewish food and culture today. Join Danielle Rehfeld, star chef and founder of The Inherited Plate, in conversation with Liz Rueven (that’s me!) of Kosher Like Me, and Amir Shaviv, JDC expert on global Jewish life today, about Jewish food and life in far-flung regions from Iran to Hungary to Belarus. Chanukah market and reception with plenty o’ noshes. Programming begins at 4:00. Drop in for any or all sessions. Click here for the full schedule and to purchase tix. Join us for an elevated farm to table dining experience in a charming industrial space to celebrate fall, support CT NOFA, and dine on cutting edge vegetarian cuisine showcasing the season’s bounty. This elegant vegetarian feast features fall vegetables proudly grown by CT NOFA farmers and cocktails crafted with small batch local spirits and seasonal ingredients. We’ll be there! Let us know if you’d like to sit together. 7-10 PM at Sugar and Olives in Norwalk, CT, with chef/owner Jennifer Balin. $100 per person ($700 for a table of 8) includes event sourcebook with menu, recipes, and farm and food sources. For more info and to register click here. Great to know: Sugar and Olives is a 3 star certified green restaurant! Thinking about an Autumn road trip that combines great food, a vibrant city and easy flights in and out? Come celebrate old and new Jewish food traditions at NoshFest, Toronto’s inaugural celebration of all the foods we love. NoshFest’s mission is to celebrate Jewish food and culture by showcasing delicacies unique to Jewish tradition and heritage while bringing together members of Toronto’s diverse community. For more info and to buy tix click here. Food historian, Francine Segan, joins Dana Cowin, Jessi Singh and William Elliot in conversation about what’s hot in food, wine, culinary innovations and all things food related. Tri-state foodies, this is for you! followed by a do-it-yourself home pickling demonstration and a tasting of the best of New York’s pickles, sauerkrauts and other fermented treats. Join Sandor Katz, James Beard Award Winner for THE ART OF FERMENTATION in convo with Chef Robert Schaefer founder of Divine Brine Foods and Rob Eshman, author of the Foodaism blog and the editor-in-chief and publisher of Tribe Media. If chocolate is your passion, get ready for the largest chocolate salon to hit NYC at The Big Chocolate Show . Meet the makers of some of the most exquisite chocolates from around the world. Roam, taste and learn from artisans, chefs and pastry makers from Europe, North and South America. Register in advance for ticketed tasting classes so you won’t miss out on learning how to pair chocolate with sparkling wine or how to taste and rate chocolate like a pro. There are a wide array of classes and demos to chose from. Sweet potato rugelach, gumbo with creole matza balls, collards sautéed with griebenes? These are just a few of the dishes that American Jews in the south have adapted from African American and white communities. Join author, Jayne Cohen, as she chats with authors Michael Twitty and Ted Merwin; Professor Hasia Diner; Jewish food historian Katherine Romanow; and Chicago Reader Deputy Editor Robin Amer. They’ll be discussing the evolution of Jewish fusion dishes rooted in the southern cuisine, race, community and identity. Light noshes will follow talk, natch. Jeffrey Yoskowitz and Liz Alpern, authors of the inspired cookbook THE GEFILTE MANIFESTO: NEW RECIPES FOR OLD WORLD JEWISH FOODS, join Leah Koenig, author of MODERN JEWISH COOKING, in conversation as they launch their manifesto’s release. Shmooze, nosh and buy a book after the talk. Students will learn how to make meat-free Korean food, incorporating basic elements of Korean cooking such as seasonal vegetables and ingredients from the land and the sea. You’ll work with fermented sauces and learn concepts of balanced flavors. An overview of pantry items that are fundamental to Korean cooking will be discussed including soy sauce, fermented soy bean paste and spicy chili paste. For more info. including questions about dietary restrictions and to register, click here. Do you have a bumper crop in your garden? Too much of a good thing in your CSA share? Worried about wasting perfectly delicious summer fruits and veggies? For more info, mouth- watering sample menu and to register click here. Kosher Like Me Cooks & We Want you to Join Us! Kosher Like Me Cooks is a new series of hands on, seasonally inspired cooking classes led by Liz Rueven and Melissa Roberts in Westport, CT. Classes are designed to help all levels of cooks explore ideas and flavors through a Jewish food lens. Wednesday, August 3rd, 11:00-1:00pm. At the end of class, we’ll sit and enjoy this Shabbat preview together. Open to 8 participants at all skill levels. To secure your spot, send check to Kosher Like Me. Address will be given upon registration. Class will be taught in a kosher kitchen with kosher ingredients. Taste of Jewish Culture Annual Street Fair is a signature event that brings together passionate foodies and dozens of purveyors of delicious food for a day of eating, learning, and celebrating in New York. Wander about and grab a nosh (or 5) from some of our favorites including: NY SHUK, Black Seed Bagel, Breads Bakery, La Newyorkina, The Gefilteria, Dinzengoff, Taim, Seed and Mill and more! For more a more complete list of activities & vendors, including those with kosher certs, click here. This year’s Street Fair is presented by The Workmen’s Circle in partnership with National Yiddish Theatre Folksbiene’s KulturfestNYC. Join Ron and Leetal Arazi, food creatives of NY Shuk, for a lavish vegetarian (dairy) pop-up celebration inspired by Persian ingredients like saffron, rose, pistachios and pomegranates. Location: Dinner will be served at Ron and Leetal’s beautiful brownstone in Bed-Stuy, Brooklyn. Exact address will be given upon ticket purchase. For more on NY Shuk, an artisanal food company that handcrafts pantry staples rooted in Sephardic and Middle Eastern cuisines, click here. Jennifer Abadi is at it again! This time she’s teaching an exotic, vegetarian (dairy) class that will take you on a virtual tour of the Greek Islands. Steven Rothfeld, world class photographer, fell in love with the flavors of Israeli food and spent months exploring the vibrant food scene there. His new book, Israel Eats, is a compilation of spirited stories, accessible recipes and seductive photographs of Israel’s food culture today. Would you Travel to London for Gefilte Fest? Can we agree that this is very tempting? For more info and to purchase tix click here. Join author, Michael Wex, in convo with Jayne Cohen as they dish about RHAPSODY IN SCHMALTZ, Yiddish Food and Why we Can’t Stop Eating it. click here to reserve tix. Many of these plant based foods are certified kosher. Check it out while you nosh your way through NYC’s largest meat-free expo! Vegan meals will be available for purchase. Learn to cook a range of dishes from appetizers through desserts with Jennifer Abadi at ICE, NYC. Most dishes will be vegetarian; fish will be kosher varieties only. Join Liz Alpern, of The Gefilteria, for this hands on cooking class focused on old world dishes with modern twists. Imagine mastering how to prepare vegetable soup with egg lukshen, butternut squash kugel with crispy shallots, spring fruit compote and lots more. You’ll be inspired to cook more vegetarian items for your Passover Seders after tasting these kosher for Passover dishes. This class is vegetarian and taught in a kosher kitchen. Can you Resist this Chocolate Fest? Chocolate Fest returns to 92Y, NYC for another round of learning, tasting and exploration! Culinary historian and chocolate expert, Alexandra Leaf, has added new exhibitors including some with cheese, tea and wine pairings. This is a decadent and delicious way to explore some of the best chocolate makers in NYC. For more info, including a partial list of exhibitors and to purchase tix click here. Join cookbook author and cooking instructor, Kim Kushner, as she demonstrates her exciting perspective on the new kosher cuisine. There will be ample samples to nosh at this event. For more on Kim’s cookbook and why we love it read our review here. Free-range WHAT? Artisanal WHAT? Matzah balls HOW? Jewish cuisine is changing rapidly! Meet three cutting edge writers and chefs who are leading the revolution. Talk is free but you must reserve your spot. Click here for more info. Select galleries will be open prior to the talk. Join cookbook author, Amelia Saltsman in convo with Tasting Table’s Devra Ferst as they discuss a world of diverse Jewish flavors and traditions that connect to the seasons. Saltsman’s inspiring cookbook, THE SEASONAL JEWISH KITCHEN, will be sold at this event. Click here for more info and to buy tix for this 92Y event, NYC. Everything you ever wanted to know about BBQ is the drool-worthy theme of the eve as you fire up for outdoor cooking season. Samples, including some vegetarian, will be served. Baladino, a folk band with members from Berlin and Tel Aviv, will perform authentic Sephardic and Ladino melodies during Global Sunday at the JCC Manhattan. Don’t miss this rare opportunity to catch their performance in NYC! An intimate reception with the performers, including Sephardic nibbles, will follow the performance. Click here for tix and more info. Food Trends: What’s Happening & What’s Next? Explore today’s tastiest and most interesting food trends with six times food author, Francine Segan. Taste highlights from the Fancy Food Show, learn what’s cooking at gourmet spots, restos, and on the streets around NYC and beyond. click here for more info. and to purchase tix. Zachary Golper, Chef/Owner of Bien Cuit, Brooklyn, chats with food writer Peter Kaminsky about his prized loaves, the artisanal food scene and his quest for maximum flavor and the perfect loaf. What’s up with NYC Beer Renaissance? More than a dozen new breweries have opened in NYC in the last three years! Sample some of these brews and discover mostly local cheeses paired perfectly to compliment them. Join Professor Ted Merwin, author of Pastrami on Rye, as he explores the birth of NYC’s Jewish delis and the history that led us to today’s renewed passion for the delis of our grandparents’ era. Kosher pastrami, corned beef and more will be served by the iconic 2nd Avenue Deli, NYC. Join thinkers and doers in the Jewish food movement to explore new angles on food and our changing environment. Learn alongside passionate experts, growers, rabbis, writers and cooks, as you delve deeply into how to positively impact the future of our sustainable food systems. Celebrate New Year’s Eve with over 200 new friends at this annual conference/retreat. All meals are included and are kosher. December 29, 2015- January 1, 2016. Isabella Freedman Jewish Retreat Center, Falls River, CT. Celebrate the second night of Chanukah at the 7th Annual Latke Fest in NYC! Mingle with NYC’s most respected latke mavens and chefs as you taste their sizzling creations. For a list of participating restaurants and a list of last year’s latke stars click here. General Admission $65.00. Click here for more info and to purchase tix. And you’ll be doing a mitzvah as you nosh! The Latke Festival benefits The Sylvia Center, a nonprofit dedicated to teaching children and teens how to cook and eat well. Note: Many of the latkes will be vegetarian. This is not a kosher event. Instead of running out to buy bagels on Sunday morning, Learn to bake bagels and bialys in this hands on class at The Center for Kosher Culinary Arts in Brooklyn. After this class, you’ll bring home plenty of goodies and you’ll be ready to whip ’em up in your own kitchen! What’s cooking in Canada’s Jewish food scene? From schmaltz-fried rice to Nutella babka bread pudding with maple syrup to classic gefilte fish— the Jewish cuisine of Canada is sizzling. Join Jayne Cohen, author of Jewish Holiday Cooking, as she explores the scene with Anthony Rose of Fat Pasha and Schmaltz Appetizing; Ruthie Ladovsky of United Bakers Dairy Restaurant; food writers Michael Wex and Bonnie Stern. Chef-Partner of her restaurant, by CHLOE, and the first vegan chef to win a television competition on the Food Network’s Cupcake Wars, CHLOE COSCARELLI will bring her deliciously satisfying vegan and plant-based dishes to De Gustibus , NYC for a demo and generous tasting. Madhur Jaffrey, veteran food writer (40 years plus!) and seven-time James Beard Award winning author, will speak with Karen Page about the vibrant, vegetable and grain based foods in her newly released and much anticipated cookbook. Join the conversation and learn more about VEGETARIAN INDIA: A JOURNEY THROUGH THE BEST OF INDIAN HOME COOKING. Madhur Jaffrey will be signing books following the talk. Step out this Sunday morning for a multi-sensory experience of film viewing, discussion and (you guessed it) a deli lunch! Filmmaker Erik Greenberg Anjou will introduce the screening of his latest documentary, Deli Man, followed by a moderated Q&A with Gabriella Gershenson, the food features editor at Every Day with Rachael Ray magazine. A deli lunch catered by Katz’s, 2nd Ave Deli (kosher) and Mile End will be served. Click here for more info. and tix. Join Chef Jennifer Abadi for a hands on cooking class and learn to prep six vegetarian, healthy and hearty dishes from the Middle East. Enjoy eating dinner together at end of class. Click here for more info. and to register. Isaac Bernstein, Chef and Culinary Director at Pomegranate Supermarket, the largest premier kosher market in the USA, will demo, prepare and share tips and tastes from his most popular dishes. We’ll be there! Let us know if you can join us. Michael Solomonov, Chef/Owner of Zahav Restaurant in Philly, showcases the many influences on Israeli cuisine while highlighting seasonal and local ingredients. Catch this James Beard Award winning chef in convo with Frank Bruni and stay for his book signing as he discusses his newly released cookbook, ZAHAV: A WORLD OF ISRAELI COOKING. Note: This calss is vegetarian, dairy free and taught in the JCC’s kosher kitchen. Sniff, Swirl and Savor six different Scotches with Tommy Tardie, The Flatiron Room, NYC. You’ll gain an in-depth understanding of how diverse Scotch whiskey is. This farm to table dinner highlights the most creative chefs and producers in Fairfield County, CT. Among the non-meat options will be local cheeses, roasted golden beet gazpacho, whole grain salad and a vegetarian main course of roasted portobellas stuffed with quinoa and other farm fresh goodies (PLEASE specify “vegetarian” when purchasing tix). All proceeds benefit the educational programs at Wakeman Town Farm. Join Adam Sachs, editor-in-chief of Saveur Magazine, in conversation with cookbook authors Kim Kushner (The New Kosher) and Max and Eli Sussman (Classic Recipes for Modern People). They’ll be shmoozing about what Jewish cooking is today, how it has evolved, and how we express ourselves through our food. 92Y is at 1395 Lexington Aveneue, NYC. ALL VEGETARIAN menu will have you creating multipe dishes highlighting summer’s bounty while learning more about basic knife skills and pantry staples. Eat what you make with your classmates. Take home recipes. You are invited to join an exciting evening featuring celebrity chefs and cookbook authors as they compete in a cooking challenge inspired by the hardships that MASBIA soup kitchens has experienced in its ongoing mission to feel New York’s hungriest. Do a mitzvah! Click here for more info and to buy tix. Moss Cafe’s gourmet supper club will celebrate farm to table, local, organic, seasonal and kosher gourmet dishes. Like-minded eaters rejoice! A six course tasting menu will be served to guests around a communal table as each course is introduced by the Moss team. Expect to be wow’ed and inspired as you meet new friends and share the highlights of New England’s mid-summer harvest. For more about Moss Cafe and to reserve your spot click here. Moss Cafe, a farm to table cafe and espresso bar, is strictly kosher. It is located in Riverdale (Bronx), NY. Cheese enthusiasts will visit three of the most exciting spots to taste and buy cheese in NYC. Chef Russell Moss will guide you to Murray’s, Di Palo’s and Saxelby where you’ll sample, learn how cheeses are made, better understand how to serve and present, and finally, pair cheeses with food and wines. Clinical Herbalist, Tynne, at Catch a Healthy Habit in Fairfield , CT presents a 3-part series that will give you the tools to support your health by making home remedies. Learn to make infused herbal oils, infusions, first aid kits, fermented foods, lozenges and much more. Classes are hands on and there will be hand-outs and samples at each class. For more info on what will be taught in each session and to register click here. Check the menu pre-pay here. Nosh your way through vendors selling bagels, falafel, pickles, knishes, bialys, all sorts of deli stuff and smoked fish. Book-signings and Klezmer tunes- maybe even dancing in the streets! The Center for Kosher Culinary Arts is hosting a juicy hands-on cooking class for men who love to grill! Learn how to create mouth watering BBQ style dishes indoors and outdoors. Explore indoor smoking with wood chips, stovetop & outdoor grilling, slow cooking meat, classic BBQ sides and sauces, and more. Ready to amp up your cooking and/or baking game this summer? The Center for Kosher Culinary Arts (CKCA) is moving some of their most exciting summer programs from Brooklyn to NYC for the summer! Summer Intensives are open to all enthusiastic cooks and bakers ready to focus on skill building with hands on cooking/baking. Classes are open to all levels and begin on June 29, 2015. Students myst be 17 to participate. Register early as these classes have limited space and they sell out. Find full descriptions and registration info. for daytime session, evening sessions and for baking intensive by clicking on your interest. Love whisky or know someone who does? Check out the 4th Annual NYC Charitable Whisky Tasting hosted by the Jewish Whisky Company’s Single Cask Nation. Here’s your chance to taste 250 plus of the finest whiskeys from the USA, Japan, Ireland, Scotland, India and beyond. Glatt kosher catering (vegetarian options available) by Ari White, Gemstone Catering (yup, the Wandering Que). A limited number of tix will be sold and this event sells out. Click here if you want to learn more and make l’chaim with this crew. Join the conversation as Suzanne Pope, author of SMALL BATCH: PICKLES, CHEESE, CHOCOLATE, SPIRITS and the RETURN OF ARTISANAL FOODS discusses small batch production with local food artisans. Book signing and tasting will follow panel discussion. Enjoy a delicious and locally grown vegetarian meal as Chef shares the secrets to cooking healthy grains like farro and quinoa. Learn how to prepare early spring crops abundant in your farmers’ markets right now (leeks and fennel and more, oh my)! Sugar and Olives, Norwalk, CT, sources ingredients from over 15 local CT farms. You’ll be inspired to eat seasonally and shop locally, for sure. Have you always wanted to learn to bake this old world classic? The Center for Kosher Culinary Arts is offering a hands-on class in Babke Baking! Learn how to make this yeasty dough and fillings, plus more. Bring warm, fresh babke home and wow your family and friends. Learn how to make fresh, delicate and delicious TOFU at the Natural Gourmet Institute in NYC. Once you taste this silky delicacy you may never want to eat store-bought tofu again! Lemon Tofu Panna Cotta, Baked Tofu in Lemon, White Wine and Butter, Asian Noodles in Spicy Dashi with Fresh Tofu. Spend this special eve learning from Peter Berley, James Beard and IACP award winning author, chef and culinary instructor. Like- minded eaters and kosher keepers like me, this is for you! The first ever vegetarian food rave is happening in CT this weekend! More than 20 local restaurants and food vendors will be showing off their vegetarian dishes. Cash bar and live music, too! Pay $5.00 to enter and chose from a wide array of small plates. Each plate cost only $3-$4. For more info check out three60event’s facebook page here. Anyone up for attending with me? Let’s plan on my facebook page here. Join the conversation as proprietors of Katz’s Deli, Russ & Daughters, and Isaac’s Bake Shop dish with food critic Arthur Schwartz and WNYC’s Leonard Lopate. They’ll be touting NYC’s legendary Jewish eateries and exploring why we love them so. Complimentary noshes, drinks and music by Lisa Gutkin of the Klezmatics. This event will include a slideshow of photographs from Aaron Rezny’s new book Eating Delancey. The Philly Farm and Food Fest has blossomed into a tremendous resource intended to connect farmers, food producers and consumers. Attendees will have the opportunity to taste hundreds of delicious samples of local food (plenty of veg friendly items) and find new ways to buy, cook, grow and share local food every day! Classes are all vegetarian (some kosher friendly fish may be served) and intensive hands on/demos. Click here for full descriptions and ticket purchases. This is a fascinating introduction to Jean Michel Carte Blanche Brut, one of the most complex and difficult champagnes to produce. Learn the proper tasting protocol as you explore France’s first organic, kosher mevushal champagne. What makes this champagne different from all the others? Learn all about it and taste with Oumy Diaw, the first and only official Champagne Sommelier. 7 PM at 92Y, Lexington Ave. and 92 St., NYC. fee: $45. Buy tix here. Israeli food personality, Gil Hovav and food writer Adeena Sussman are taking charge of the kitchen at Vino Levantino in an EatWith event, NYC. Their Yemenite and Middle Eastern menu includes kubanah, Idam, Israeli salad, hummus, schug, chilbeh, resek and ja’aleh. 4 events: Dinners on March 18 and March 19 OR 2 Brunch options on March 21. Need a translation and a reservation? Note: This is a kosher friendly event with fish and vegetarian options galore. Vino Levantino is not a kosher resto. Meet, shop, eat, learn as you join like-minded thinkers at the third annual CT. NOFA Conference from 8:30 AM- 5 PM. This is a great resource for anyone interested in gardening, farming, or learning about clean food. Panels , speakers and vendors will address issues of sustainability, backyard gardening, green food production and more. Great food vendors will be offering lunch and snacks, with plenty of vegetarian options. 79 Newtown Turnpike, Westport, CT.
Join other enthusiastic bakers as we prepare an array of hamantaschen. Share with family and friends as you explore a variety of scrumptious fillings. Click here for more info and to register. RSVP is required. Fascinated by the story of Russ and Daughters, the 100 year old family owned appetizing store on the Lower East Side of NYC? Mark Russ Federman will show clips from the film, The Sturgeon Queens, answer questions and sign copies of his book, Russ & Daughters: Reflections and Recipes from the House That Herring Built. Bagels with a smear, smoked fish and sweets will be served, of course! click here for tickets ($36. non-members; $25. members). Learn all about HARISSA, a chili based Middle Eastern condiment, from award winning, small batch producers Ron and Leetal Arazi of NY Shuk. Red Lentil Soup with Harissa, Pan-Fried Fish Kebabs simmered in Harissa broth, Middle Eastern Chickpea Stew (Msabbaha) and more. Class is vegetarian plus kosher friendly fish. Kosher Food and Wine Experience is back! Over 25 food and dessert vendors join 40 vintners to strut their stuff and offer generous noshes and sips at this annual kosher foodies’ playground. This event sells out quickly so buy your tix in advance. Buy tix here. 21 and over only. Once again, Chef/Owner Tim LaBant, Schoolhouse Restaurant in Wilton, CT, presents Vegetarian Wednesdays at his charming & historic restaurant along the Norwalk River. An inventive 4 course, prixe fixed menu at $40.00, will be presented every Wednesday night, January – March. To read more about why we love these Wednesday night vegetarian feasts, check out what we wrote here. Kick off 2015 by learning to whip up Mexican specialties from an expert. Get ready to taste and learn about Mexican cocktails, the most classic POBLANO chile sauce, unexpected twists on guacamole and more. This demo and tasting will be taught by Shelley Wiseman, cookbook author, food writer, and chef who spent 12 years at Gourmet. She has worked for Fine Cooking Magazine and many other publications and is currently inspiring enthusiastic cooks at the Farm Cooking School in Stockton, NJ. This is a couples event; all food will be kosher. The Candle Cafe, Candle 79 and Candle West team, NYC, will present a cooking demo with tips and tastes from their 20 plus years of creating vegan dishes to loyal customers. Celebrating seasonal produce, local growers, family traditions and plant based meals has been their consistent mantra. To read more about why we love Candle, click here. Pop-Up Shabbat Dinner: The DarJewling Ltd.- a quirky, colorful and proud celebration of the ancient and proud Indian Jewish community. Chef Anna Roy will be at the stove, preparing a flavorful and aromatic dinner of steaming rice, dal and much more. Gin based cocktails infused with the spirit of the tea and spice markets are on the menu. Expect to fall in love with the sounds of North India as Eric Fraser and his trio fill the room with tunes on the classical bansuri flute and tabla. Note: Vegetarian selections will be offered. This is not a kosher event. Jennifer Abadi, author of A Fistful of Lentils, will show you how to maintain the spirit and tradition of Hanukkah with her fresh, modern take on conventional recipes using lighter, healthier ingredients. Learn more and register by clicking here. Meet Janna Gur, author of Jewish Soul Food: From Minsk to Marrakesh, More Than 100 Unforgettable Dishes Updated for Today’s Kitchen, in conversation with Jayne Cohen (Jewish Holiday Cooking). Gur’s latest book takes readers and home cooks beyond sentimental favorites to the most exciting renditions of over 100 Ashkenazi and Sephardi recipes from around the globe. Book signing will follow this event. Sunday, November 23, 2:30-4:00 P.M.
Israeli cuisine is finally on the tip of Americans’ tongues and they love it! Join Chefs Joan Nathan, Lior Lev Sercarz and Michael Solomonov in conversation with filmmaker, Roger Sherman, as they explore all of the delicious facets of the Israeli food scene. Roger Sherman, award winning director of the upcoming PBS series, The Search for Israeli Cuisine– A Portrait of the Israeli People Told Through Food, will show preview film clips. Five Boroughs Food Talk is a series that explores trends, makers and influencers impacting New York’s distinctive food scene. Join Gabriella Gershenson, food features editor at Every Day with Rachel Ray magazine as she dishes with a panel of special guests, all of whom are working to “preserve and advance the art of Jewish food“. Tuesday November 4 @7:30 PM. Tix $15. Click here for more info and to buy tix. Hankering to learn how to bake these NY classics? Now’s your chance! Center for Kosher Culinary Arts, Brooklyn, NY. This is a hands on class; get psyched about bringing home plenty of goodies. Called a ‘culinary guru’ by The New York Times, Dorie Greenspan is one of America’s premier bakers with six James Beard and IACP awards to her name, including Cookbook of the Year – twice! Come meet her and listen as she chats with Dining section writer and cookbook author, Julia Moskin, about her latest book, BAKING CHEZ MOI. 92Y, Lexington Avenue at 92 Street, NYC. Click here to buy tix. Grab tix to join Yotam Ottolenghi, London based, Israeli born culinary superstar, for book-signing and an afternoon of savory stories. He’ll be dishing about his latest cookbook, Plenty More, and we can’t wait to see what’s new! This 92Y event will sell out quickly so don’t be pokey about this one. Click here for tix and venue deets. Note: this event is being held off-site at Nightingale, 20 E 92nd St. NYC. Jennifer Abadi, Syrian food expert and cookbook author, will be teaching a hands on cooking class with six dishes you will want to add to your tool box for those Meatless Mondays. Warm brisket tacos with salsa verde or guava and cream cheese on matzah? Where do these ideas come from? Join the mouthwatering discussion about Sephardic cuisines of Latin America and how they’ve influenced the food landscape today. Jayne Cohen, cookbook author, will be speaking with: cultural anthropologist and filmmaker Ruth Behar, Chef Sam Gorenstein and food writers Leticia Moreinos Schwartz and Susan Schmidt. They’ll be dishing about traditions and recipes from Mexico, Cuba, Brazil, Columbia and of course, Miami! Everyone is invited to savor a Latin American influenced Jewish desserts at a reception following the program. For more info and to purchase tickets click here. Ready Set Grill and Taste! The heat is on at the First Annual Southern New England Kosher BBQ competition! After months of recipe testing, more than 20 teams will finally fire up their individual grills to smoke brisket, chili, chicken and ribs. Come taste and vote! This is a family event with plenty of fun for the kiddos. While the blind judging happens behind closed kiddush room doors, celebrity judges will be there to taste and shmooze with the crowd. You never know who you may meet! Entry is free with 2 cans of food for the local food pantry. Start by learning how to make airy whole wheat pita by hand and then move on to some of the quintessential fillings you’ve always loved. Recipes are all vegan/pareve (except for one which includes optional dairy). You’ll learn many classic Middle Eastern salads and dishes in addition to new versions of old favorites like Israeli style hummus with ful medames (cooked, mashed and seasoned fava beans) and pan fried falafel. How ’bout a pita fattoush salad with dates, hazelnuts and optional feta? All salads and dips in this class are meant to be paired with your handmade pita pockets. This ShakesBeer Fest hosts over 60 breweries serving up their finest to help raise funds to re-open the American Shakespeare Theatre in Stratford, CT.
Local food choices with plenty of vegetarian options will be offered by artisanal CT makers like The Spud Stud and Laura’s Cupcake Boutique. $40 per person. Click here to purchase. EatWith, the global community that pairs diners seeking authentic adventures with hosts in their own homes, is offering brunch at Einat Admony‘s place. You love her food at Balaboosta and Bar Bolonat in NYC; imagine what her Yeminite via Tel Aviv influenced brunch from her home kitchen will taste like! Click here to buy your ticket. Hosted by Congregation Beth El , Fairfield, CT. Click here for more deets and entry form. There will be trophies for first, second and third place winners for best BRISKET, best RIBS, best CHICKEN and best CHILI. Best part other than a load of delicious kosher eats? This event benefits Mikey’s Way, Fairfield Firefighters, K.E.Y.S., and OPERATION HOPE. Sunday, August 3rd, 2-5 p.m.
Chili lovers who are also kosher keepers this event is for you! Team RED HOT CHILI HEIFERS will be simmering KOSHER chili to enter into this town wide competition at Wakeman Town Farm in Westport, CT.
C’mon out and support the only KOSHER entry at this HOTTER than H.… event! Kosher meat for this event was generously donated by Grow and Behold. A Taste of Jewish Culture will offer Jewish foods- Noshes past, present and re-interpreted. A line -up of New York’s best providers of Jewish inspired foods will be offering their delicious eats along Madison Ave. Seek out favorites that you’ve read about here: Breads Bakery, NY Shuk, Gefilteria and Taim, among others. click here for more info. Arrive hungry! 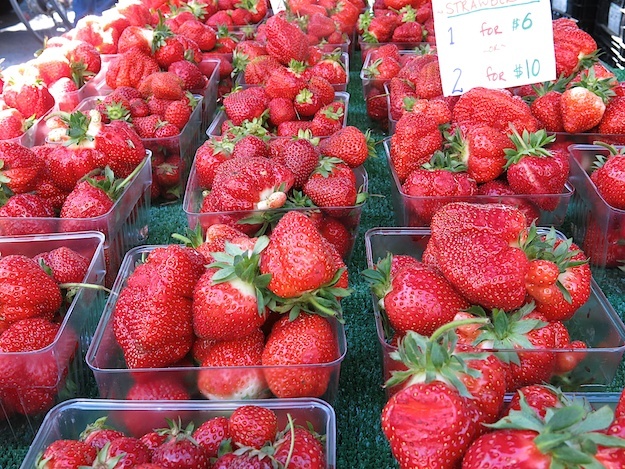 Plan an outing around picking your own strawberries! Click here to find a patch to pick in at a nearby farm. The Center for Kosher Culinary Arts (CKCA), Brooklyn, moves a load of great classes to the professional kitchen at The Ramaz School on the Upper East Side, NYC in the summer. Click here to check out their tantalizing schedule of classes for enthusiastic home cooks of all levels. Is Dad a Knish Lover? Join Laura Silver, author of the recently released KNISH: IN SEARCH OF THE JEWISH SOUL FOOD, as she dishes about her far and wide search for the origins and current manifestations of everyone’s favorite humble potato pie. She’ll be chatting with food writer and editor Gabriella Gershenson. Yes, a nosh will be served. Yes, you should check out this fascinating book and buy it for Dad (or yourself). Chef Laura Frankel, Executive Chef of Wolfgang Puck Kosher Catering at the Spertus Institute in Chicago, kicks off the Chef’s Table Series at the Center for Kosher Culinary Arts (CKCA) in Brooklyn. $150. pp including demo, exclusive tasting menu (kosher and meat), wine pairing. Click here to learn more and to buy tickets. Sugar and Olives in Norwalk, CT has launched a Wednesday Weekday Nooner cooking class series. Each Wednesday, the Nooner will present three recipes demo’ed, followed by a three course lunch and one cocktail. Recipes included. Zagat named Prime Grill, NYC, the best kosher restaurant eight years running. The NY TIMES calls Prime a place “that beckons the cool crowd”. Want to know more about the keys to Prime’s success while tasting dishes from the recently released THE PRIME GRILL COOKBOOK? Join Prime’s Chef David Kolotkin for kosher nibbles and a chat with Devra Ferst, food editor at The Forward. Like-minded eaters: here’s a dinner where everything is fair game…. if you are ready to splurge. Join an esteemed group of chefs as they honor this weekly tradition with a meat-free menu of glorious dishes. Check out this all-star chef line-up! Click here for menu and tix. Join renowned Paris-based food blogger and chef David Lebovitz for a rare New York appearance. He’ll share stories of his new French life that reveal the quirks, trials, beauty and joys of living—and cooking—in the culinary capital of the world. These stories, as well as 100 sweet and savory recipes reflecting the way modern Parisians eat today, are collected in his new book, My Paris Kitchen. Have you been ready to up your game but haven’t found the kosher kitchen that offers classes for you? Ready to stop burning meals and learn the basics? The Culinary Boot Camp at The Center for Kosher Culinary Arts is for both types of home cooks. Over the course of 15 hours of intensive instruction students will learn knife skills, basic cooking methods for chicken, meat and fish, plating and presentation and a range of other essential techniques and skills. This five week intensive begins on April 29 and meets on the next four Tuesday nights. Click here for more info and to register. You’ll be feasting on plenty of vegetarian options which include jeweled rices, aromatic stews and plenty more from her magnificent new book. Note: Haven’s Kitchen is not a kosher facility and meat will be served. Plenty of vegetarian options will be available. Learn how to host a Seder like a pro with the help of Haven’s Kitchen’s Easy Entertaining, Passover Dinner for Everyone class. Learn how to assemble a Seder plate and what the edibles symbols mean while General Manager, Beth Lieberman, walks you through the best kosher wine choices for the occasion. Chef David Mawhinney will spark your creativity with hands on demos teaching how to make barbecued brisket, a new riff on haroset and a tempting (yes) bitter herb salad. Other side dishes and plenty of tasting are a sure thing. Note: While this is not a kosher facility, the brisket will be kosher and there will be multiple vegetarian side dishes to prepare and taste. Ways to mobilize communities in order to access farm fresh, locally grown food. Click here for the full schedule and to buy tickets. Hear David Bromberg, David Broza, Dr. Ruth (!) and more as the celebration starts a week early. Kosher and Vegetarian meals may be ordered 48 hours in advance. Tix start at $55. Click here to purchase. An evening of demos and tastings by distinguished chefs with roots in Italy, Morocco, Persia, France, Syrian and South America. Join Leticia Schwartz, Levana Kirschenbaum, Poopa Dweck, Sophia Young Bapt, Silvia Nacamulli and Lerone Edalati as they share their cultural and food memories, recipes and noshes. Opening remarks by Joan Nathan. Keynote speaker: Sara Esther Crispe. To see more about the full line up of presenters click here. Join Joan Nathan in conversation with Pati Jinich, Louisa Shafia and Ari White as they dish about what’s cooking WAY beyond matzah balls. Imagine latkes, kugel and brisket like you’ve never tasted before. Now stretch your imagination a lot further! KOSHER tasting will include*: Barbecue Sliders, Norooz inspired Rice with Fava Beans and Dill (Baghali Polo), Crunchy Quinoa Salad with Pomegranate and Jalapeño, and Gefilte Fish a la Veracruzana (* menu may change). Sunday, March 9, from 10:00 am until 5:00 pm. Twenty exhibitors and vendors, including organic farmers, homesteading experts, artisan food producers, specialty food retailers, and organic restaurants, will share their products and expertise at Audubon Greenwich. Lunch and nibbles will be offered by local artisan food producers and restaurants. Tasting workshops include artisan honey, ultra-premium extra virgin olive oil, organic chocolate, bio-dynamic champagne and local cheese @ $10. each. Click here to buy admission and tasting session tix. Plenty to nosh on, all dairy free! Tix are $30 for a full day pass, if purchased in advance. Click here to learn more and to purchase. What’s Next for the Jewish Food Movement? with Nigel Savage, President and Founder of Hazon Jewish Sustainability Org. This lecture, which is open to the public, is part of a Jewish Environmental Ethics Series at JTS. Read more here. A True Sign of Spring! You read it here and asked WHEN oh WHEN will Veggie Tales happen at CITY GRIT again ? Click here for more info and to reserve your spot. New York’s premier showcase for Kosher food and wine at Pier 60, Chelsea Piers, has rented a luxury yacht JUST for highlighting and tasting desserts, desert wines and making l’chaim at the mixology bar. Don’t forget to start the fun by noshing inside first. Trust me, you won’t walk away hungry! The party will be bigger than ever this year. Tix sell out and will not be sold at the door. Click here for more info and to purchase your tix. Doors open at 5:30. Must be 21 to enter. Are You a Food Filmmaker? The Food Film Festival screens award winning independent documentaries, features and short films that highlight the most memorable foods. For a multi sensory and unique experience, the food being watched will be served to the audience. Click here for submission guidelines and deets. Explore Passover themes while enjoying plenty of fruits and vegetables at the beautiful Nosara Retreat Center in Costa Rica. Study, yoga, exploration and surfing will be offered. Now we’re talking FREEDOM! Register early. Click here for deets and more information. Wondering if it’s worth it to shop your winter green market? And what can you cook with all of those roots and stuff? Haven’s Kitchen is offering a class to help you figure it all out. Field Trip to Union Square Greenmarket, N YC, followed by hands on vegetarian cooking class and lunch. click Haven’s Kitchen for more info and to register. Click here to read about the Haven’s Kitchen class I attended and why I loved it. Are you up for a Dinner Adventure? Are you up for a dining adventure with new friends and expert hosts in their Brooklyn home? That’s what EatWith is all about! Join NY Shuk owners, Leetal and Ron Arazi, as they host a Middle Eastern and North African inspired dinner. There will be plenty of veg friendly choices in this multi-course meal. Hand rolled cous cous? That’s just one of their expertise. Click here to learn more about hosts, Leetal and Ron Arazi. Click here for more deets on this event and to register. The SCHOOLHOUSE in Cannondale, CT is launching their Vegetarian Wednesday dinner series again. And it’s a great deal with 4 courses for $40. Wine pairings are available, too. You don’t want to miss this experience tasting what Chef Tim LaBant can do with winter veggies. Local, seasonal, organic, Tim’s been doing it this way since his start. Reserve early. The Schoolhouse is only offering these Vegetarian Wednesdays in January. Click here for more info and to reserve. Ready for a new kind of dining adventure? EatWith offers unique opportunities to join like-minded eaters in hosts’ homes to share delicious eats and conversation with new friends. How ’bout hosting a brunch while this professional chef whips up a Mediterranean inspired, organic and vegetarian spread of Shakshukah topped with cilantro tehini espuma? Add fresh salads and whole grain breads straight from the oven. You set the date with the chef. His home in Brooklyn is kosher, too! Click EatWith to learn more. There’s no reason to resort to bad movies and even worse food on December 24. Join comedians Joel Chasnoff, Todd Barry, Judy Gold and a line-up of hilarious comics for a 90 minute live stand-up special at City Winery, NYC. Plenty of great Kosher wines will be available along with tasty vegetarian nibbles. Join thinkers and doers of the Jewish Food Movement for 4 inspiring days of lectures, discussions and new friends, expert cooking demos, a Rockin’ New Year’s Eve party, and thoughtfully prepared, delicious and kosher food. Click here to read how much I loved attending the Hazon Food Conference in 2012. Looking for a Chanukah celebration? Head to Randolph Beer in SOHO for the 92Y’s 6th Annual Beer and Latkes Party. They’ll handle the pairings of brews and sizzling latkes. Dreidel spinning and other games, well, that’s up to you. There will be candle lighting and plenty of song, for sure. Donate to CT Food Bank. It’s Virtual. The CT Food Bank has made it super easy to help out those in need this Thanksgiving. Consider donating on line and share the goodness. Donations begin at $14. Click on CT Food Bank for more info or click here to make your donation. Don’t forget to tell your kids, or better yet, shop for food items WITH them. Join kosher baker Paula Shoyer at ICE (Institute of Culinary Education), NYC, for her sweet Chanukah baking class. On the menu: Chocolate Ganache Doughnuts, Churros, Tropical Doughnuts with Mango Passion and more. Ready to bake a new dessert? Learn how to make all of the components of adorable CakePop treats. This class is great for teens and their Moms or party throwers looking for a new dessert. Bake, assemble all components, master a variety of decorating techniques, explore how to present and display them, even package them if you’re sharing. City Grit is at it again! They’re serving their final Shabbat dinner of 2013, with kosher meat and no mixing of dairy. Click here to read more about my experience there a few weeks ago. $55.00 in advance by clicking here. Want to Learn More about Vegan Cooking? This is a great primer for the holidays! Carissa Dellicicchi, co-owner and head chef at The Stand, will be teaching how to make 4 courses, including dessert. Come to the class ready to eat an array of delicious organic vegan food and take home all recipes. All recipes will be vegan and gluten free. Kosher keepers: vegan means parve and that’s a great thing. Join food historian and chocolate expert Alexandra Leaf for an over-the-top, five stop tasting tour of all things chocolate. Taste the best of NYC’s chocolate! Join CT’s cheese makers, wine makers, chefs and small producers during the peak of Autumn for a great day of tasting at Hopkins Vineyard, New Preston, CT.
Buy tix by clicking here. $20. in advance or $23.00 on day of. Cookbook author, restauranteur and culinary star, Yotam Ottolenghi joins partner and co-author Sami Tamimi in conversation about their new book, Ottolenghi, the Cookbook. Listen to Francis Lam, food writer/editor and TOP CHEF MASTERS, as she guides these talents through conversation. Join food writers and Israeli food experts: Janna Gur, Gil Hovav, Naama Shefi and Bonnie Stern in conversation with cookbook author, Jayne Cohen. They’ll be dishing about Israel’s highly creative culinary landscape beyond hummus and pita. A reception featuring contemporary Israeli dishes by chef Einat Admony (Balaboosta and Taïm) will follow. Sarah Simmons is at it again, cooking up her Southern style brisket (kosher) and plenty of fixin’s to go with. Don’t miss this multi course, high spirited event at City Grit, a one-of-a-kind culinary salon in SOHO, NYC. Einat Admony, Chef-Owner of the wildly popular NYC restaurants Balaboosta and Taim, will join NY TIMES food writer, Julia Moskin, in conversation about all things Israeli and Mediterranean inspired. This well timed event coincides with the release of Admony’s first cookbook. Tastings and conversation are sure to thrill. Mollie Katzen, author of the much adored THE MOOSEWOOD COOKBOOK, shed new light on the way a generation of Americans thought about vegetarian cooking. She’s doing it again with her new book, THE HEART OF THE PLATE. Come hear her thoughts as she chats with NY Times food writer, Julia Moskin. Sarah Simmons is at it again at City Grit, her culinary salon in SOHO, NYC. She’ll be cooking up a harvest dinner with the best of the season’s produce from local markets at this five course vegetarian feast. $55.00 for 5 courses. Beer and wine available for purchase that eve. The Natural Gourmet Institute, NYC, is offering a demo and cooking class that explores the many possibilities of tofu. Begin by preparing homemade tofu and taste its superior nutty flavor. Recipes will include a range of dishes (all are vegan except for one) including tofu steaks with black beans and mango salsa, and Lemon Tofu Cheesecake “Angelica’s Kitchen Style”. Haven’s Kitchen, NYC, celebrates the New Year with Ron and Leetal of NYshuk cooking and sharing Sephardic culinary traditions. They’ll be preparing a fully kosher, Middle Eastern feast for this wine-paired dinner. Luscious dishes like Matbucha and Tanzeya will follow cocktails and canapes that kick off the celebration in the teaching kitchen. Move upstairs to the event space and join a party of 30 lucky guests. Click here for more info and to reserve your seats. Hurry, as these tickets will go fast! Featuring a vegetarian dinner of this farm’s vegetables grilled for vegetarian lasagna, vine ripened tomato bruschetta, red wine glazed peaches and more. This farm style family supper includes four Jones Family Farm wines paired with each course. Join other enthusiastic bakers and learn to bake challah from a NYC pastry chef at one of EatWith‘s first NYC events. You’ll join Rinat in her home, learn the in’s and out’s of challah baking, and toast the start of the weekend with a goblet or two of chilled white. WHAT IS EATWITH ALL ABOUT? Click here to sign up and learn more. Kosher Like Me readers should type NEWYORK at checkout for a discount. Did you know that wine is being made in CT?? There are 25 wineries on the CT Wine Trail! These 12 CT wineries will be featured and sampling. White Gate Farm presents their final Dinners At the Farm highlighting the bounty of this 100 acre organic farm in Lyme, CT. Dine in the field (yes, there are tables and chairs) and share the pleasure of eating fabulous dishes using ingredients that were picked earlier that day. Communal tables encourage making new friends. Vegetarian meals are available ONLY if requested upon registration. Wine is included. If you haven’t attended one of these celebrations, now is the season. It is truly unforgettable! Learn more about White Gate Farm’s year round farm stand, cooking classes and other offerings here. Register for Dinner at the Farm by clicking here. Wondering how to respond to your local summer market’s bounty without being overwhelmed? Want to cook seasonal,mouthwatering dishes with ripe local fruits and crisp veggies and herbs? JCC Manhattan presents “Cooking Creatively from the Market”. Whip up multiple dishes using greenmarket ingredients with Chef Irene Yager. Shop the Union Square Greenmarket in the morning with the chef, if you’re available! Wondering how to pair cupcakes and cookies with beer and wines? Sip and nibble your way through Sweet Revenge‘s superb and highly creative pairings as you learn from owner, Marlo Scott. Monday, July 8 @ 6 PM, $45. See an exciting array of Sweet Revenge’s unexpected pairings here. CELEBRATE local ingredients and the chefs who love them by choosing to dine in any of these participating restaurants this week. Manhattan will be buzzing with an array of events, too! Click here to see the list. And if you would like to know what it’s like to drink local, be sure to check this list of participating Tri-state wineries helping to lighten the mood. Learn quick and easy techniques for preparing a variety of fish dishes for your summer dinners. Among the recipes learned in this hands on class: Moroccan sliced seared tuna with harissa, and chipotle grilled “scallops” with golden pineapple salsa. Finish with chilled fresh strawberry soup and you’ll know it’s finally summer in the kitchen. 334 Amsterdam Ave. at West 76th St.
I’ve waited for this one and it’s finally here! CITY GRIT is presenting an all vegetarian menu featuring the season’s best produce from the Greenmarket. Imagine tender new potatoes, fresh English peas, Sweet Berry Farm’s strawberries. Those are merely hints. $55.00 pp. Wine and beer available for purchase. Click here to purchase tix. Friday night dinners at the Natural Gourmet Institute in NYC are a culinary magnet for those in the know. Chef Instructors and students prepare ALL VEGETARIAN, 3 course meals, using seasonal ingredients as they show off their talents. Reserve in advance by clicking here. Abbie Rosner, author of BREAKING BREAD IN GALILEE, shares tastes and tales of the people, culinary traditions and communities, both ancient and modern. Ambler Farm, Wilton, CT celebrates the beginning of summer on June 15 with Dinner in the Garden. This one is perfect for vegetarians and anyone KLM! The talented Maria Munoz del Castillo, Bistro du Soleil, will be cooking up a four course dinner with mostly veg appetizers and poached salmon entree (choice). Many ingredients will be harvested from the farm. $95 for members; $110 for non-members. Click HERE to see menu and to register. Don’t wait, though. This will sell out quickly. Westport Farmers’ Market opens Thursday, May 23 with 30 plus vendors and a weekly rotation of local chefs sharing tastes and tips. Green toast at high noon on opening day to celebrate. 10-2 every Thursday May 23-November 7.
click for vendor list and more info. See you there! How about a Middle Eastern Shabbat Dinner in NYC with the Brooklyn mavens of couscous? Mark your calendars and buy tix early! Deets: Two eves being offered: May 17 or July 26, both begin @ 7 PM at Haven’s Kitchen with NYshuk Chef Ron Arazi and pastry chef, Leetal Arazi. Learn to hand roll couscous, simmer dried fruit and nuts with slow roasted KOSHER lamb, compose Middle Eastern salads. Eat it with your new friends and wash it all down with an ARAK cocktail. Join Chef Avram Wiseman, Dean of students at CKCA, as he leads participants through a full menu of classic breakfast and brunch dishes. Moms and kids of all ages welcome! Click HERE to register or for more info. Happy Day! Dishcrawl Old Greenwich; VEG option! Have you heard? Dishcrawl dates in Greenwich, CT flew off the laptops so quickly that a third date has been added. $45 buys you a tix to join other foodies, check out four outstanding local restaurants in one evening, and enjoy the surprises waiting for you. You’ll find out where you start by e-mail, 48 hours before. Tell Jesse Leeds- Grant, Greenwich Dishcrawl Ambassador, that you are vegetarian if that’s what you’d like: jessel@dishcrawl.com. Hunger in the U. S. A.? This film takes viewers inside the lives of three people struggling with hunger in America. A panel discussion featuring Chef and CEO / President of WholesomeWave Michel Nischan will be held after the screening. The film is rated PG. TIckets are $10 and available at WestportCinema.org or at the door. Join guest chefs and educators to explore the connection between food and Torah through text study, farm tours, cooking demos, permaculture workshops and lively Shabbat services. All kosher meals are included and are from ethically sourced, farm fresh ingredients. Presenters include cookbook author, restauranteur and teacher, Levana Kirshenbaum, and Michael Solomonov, James Beard Foundation award winning chef and owner of Zahav and Citron and Rose, Philadelphia. Click here for more info and registration. Use discount code “friend” for $50. off weekend fee. Chocolate Fest at 92Y in New York —may just have you drooling as you taste and chat with some of the world’s most talented tastemakers. Sip a chocolate cocktail, pair cheese with confections, sample rare treats and savor classic French pastries. Click here for more information and tickets. Click here for a list of the impressive line-up of producers. City Grit is a culinary salon in NoLiTa and brainchild of Sarah Simmons, recently named one of America’s Greatest New Cooks by FOOD AND WINE MAGAZINE. Sarah’s delicious Southern-influenced Shabbat dinners are a super special, multi-course dinner featuring her take on traditional Jewish classics. Kosher Like Me? Not a problem. Specify VEGETARIAN when registering here. Enjoy six glorious days touring Israel and experiencing the sustainable food movement first hand through a partnership of Hazon and the Heschel Sustainability Center. Sport Hill Farm, an organic farm in Easton, CT, has announced that registration is open for their weekly, summer CSA (running early June-Mid October). Pick up will be at Westport’s Wakeman Town Farm, Fridays, 1-7PM. Find more information and Register while shares are still available. Looking for restaurants offering Passover Seders? Prime at the Bentley (500 East 62nd Street at York) AND Solo (550 Madison Avenue btw 55th & 56th Streets) both offer strictly kosher Seders in NYC. Add flavor and laughs to your Seder when you bring along or ship ahead Gefilteria‘s fresh, artisanal Gefilte fish, carrot citrus horseradish, sweet beet horseradish (all kosher), a copy of Old Jews Telling Jokes (maybe not so kosher) and a matching apron to humor your host. Click here to order while supply lasts. Leticia Moreinos Schwartz, Brazilian Chef and cookbook author, will demo and share tastes of her Brazilian specialties at a women’s cooking event in Westport, CT. Event will be kosher. Click here to register. Location will be sent upon registration. On Tuesday, March 26Th Balaboosta will join forces with Chef David Tanis (New York Times columnist) and Pastry Chef Keren Weiner (Il Buco) to present an inventive second night Seder dinner. The celebration will include a five course Seder dinner , wine pairings and live music by Shahar Mintz and Naomi Less. Vegetarian options are available if requested in advance. The lucky afikoman finder will be rewarded, of course! The festivities begin at 6:30 PM. Warrup’s Farm (organic) in Redding, CT. as they demonstrate how sap is collected and made into syrup. Kosher Like Me? Taste it all at the NYC Vegetarian Food Fest! Click here for more info and a full schedule of vendors and activities for kids and adults. The After Hours Kubbeh Project is a pop-up serving Jewish Iraqi comfort food in a creative environment. The Kubbeh Project will live for only 3 weeks at Zucker Bakery in NYC’s East Village. Executive Chef Itamar Lewensohn, Cafe 48, Tel Aviv, will be creating new takes on traditional kubbeh. All meat is kosher and vegetarian options abound. Click here for more info. Chef Russell Moss is cooking up sweet and savory combos you’ve never dreamt of for this celebration! Think oven roasted tomatoes with cinnamon and jalepeno, for starters. Martini pairings will heighten the festive mood, no doubt. Buy tix early for this one. Join Context for a walking seminar with docent Jennifer Abadi, chef, cooking instructor and cookbook author on February 12, 10 AM- 1 PM. This Jewish Cuisine and Culture walk will lead participants to the great culinary landmarks of the Jewish Lower East Side. We’ll be sampling knishes, smoked fish, bialys and pickles that reflect the Jewish immigrant experience in NYC from the early 20thc- 1960’s. Calling all chocolate lovers and do gooders! Join in a sweet tasting event at the Fourth Annual Chocolate, Dessert and Wine Lovers’ Evening to benefit the Shelter for the Homeless in Stamford, CT.
Meet local companies, creators and producers. Kosher Food and Wine Experience celebrates its seventh annual tasting event. Indulge in noshes from the tri-state’s best kosher restaurants and caterers. Sip on wines and spirits from more than 2oo providers. Come hungry and ready to whet your whistle! Dan and Yair Lenchner are at it again with their seventh pop up restaurant featuring winter harvest ingredients at their best. Six courses will be served including pan fried sweetbreads with black truffles, smoked short ribs or seared sea trout, wild mushroom dumplings and more. Top it off with grilled pears graced with coconut milk caramel, kataifi, quince and cranberries. Watch it all come together while eating in the kitchen at The Foundry, Long Island City. Competitive couples ramp up your creativity and speed as you cook under the watchful eye of The Center for Kosher Culinary Arts‘ master chefs. Bring your game on as you face the market basket you’ll be given. Can you and your partner handle the pressure? Winners score a $150 gift certificate towards a future class at this kosher culinary school in Brooklyn. Join with other women for this inspirational hands-on challah baking event. Each participant will make 2 challot; one for your own Shabbat table and one to share. This evening is dedicated in loving memory to the precious children who lost their lives in Newtown, CT.
Savory stories, nosh and schnapps will be served up at Beyond Bubbie‘s star infused event at 92Y/Tribeca, Wednesday January 16 @ 7 PM. Come hear personal food stories from Mo Rocca, Carla Hall, Joan Nathan and a hilarious cast of others, including you! At last! The Gefilteria‘s small batch, sustainable Gefilte loaves, spicy carrot or beet horseradish and bottled kvass products are available in stores around NYC. These old world, traditional Jewish foods have been re-thought and re-created for modern tastes by the dynamic Brooklyn based team. Click here for store locations. Tasting is believing! In Not by Bread Alone, the world’s only professional deaf-blind acting company takes the audience on a captivating and magical tour of their inner world. As bread is kneaded, formed, and baked on stage, these extraordinary storytellers convey their memories and dreams, mixing reality with fantasy, grandeur with ridicule, in a journey that ignites the senses. Reflecting the daily activity at the company’s own Nalaga’at Center for the Deaf-Blind in Tel Aviv, this unique, immersive experience features a local version of their acclaimed BlackOut Restaurant, operated in complete darkness, and the sign language-only Café Kapish, which will be open 1 hour prior to curtain. In Italy, olive harvest and crush is cause for celebration. Enjoy a complimentary tasting flight of just pressed oils at Olivette’s tasting room and shop, Darien, CT. through December 31. They’ll be sure to walk you through it. You’ll surely love this Italian tradition. Is this your family tradition? Join other tribe members at 92YTribeca for this movie classic and an all-you-can-eat, sumptuous vegetarian, Kosher buffet provided by Buddha Bodhai. Food from 12:30pm until it is all gone. Both screenings will be on BluRay. Ticket Price: $25 in advance/$30 at the door. Click here for more info. and tix. Saugatuck Grain and Grape, Westport, CT, will be donating at least 10% of proceeds from Bubbles, Bubbles and More Bubbles, champagne tasting, to the Sandy Hook School Support Fund. RSVP on their Facebook page and join neighbors and local merchants. A contribution of $5.,to help boost the proceeds, will be requested at the door. Mitchell Davis, James Beard Foundation, will moderate a panel exploring brisket history, origins, trends and cooking methods. A reception featuring Erin Patinkin’s brisket inspired cookies from Ovenly, will follow. Click here for tix and to see who’s on the panel. You’ll be impressed! Join culinary expert and “Top Chef” judge Gail Simmons as she shares her personal connection with Jewish cooking in a conversation with the James Beard Foundation’s Mitchell Davis. Enjoy a cooking demonstration of favorite sizzling holiday treats, then indulge your inner foodie with international samplings of latkes paired with tasty vodkas.Gail will be signing copies of her new memoir, Talking with My Mouth Full: My Life as a Professional Eater.Tue, Dec 11, 8:15 pm at 92Y. Click here for tix. Eight layers oozing chocolate ganache for eights nights, rich and buttery Chanukah cookies, challah with white chocolate bits! Contact Michelle at Cake Suite, Westport, CT, to place your special order for your Chanukah festivities. Some non-dairy and gluten free items available. Chanukah begins December 8!! Cooking Demonstration and Tasting with Alessandra Rovati, food historian, cook and writer at www.dinnerinvenice.com. Wednesday December 5, 7 PM. Learn about Chanukah traditions, taste the unique flavors of this Italian region, and learn to make items your family will be wow’ed by! Click here for more information and to register for this delicious evening in Westport, CT. Location will be disclosed upon registration. WINTER CSA may include: Sweet Corn, Butternut Squash Puree, Green Beans, Peppers, Tomato, Blueberries and Pea Shoots. All veggies and fruits were harvested at Hudson Valley farms this summer. Crops were flash frozen to provide summer freshness all winter long while supporting local farmers. For more info and sign up click www.wintersunfarms.com and check Westport, CT as your pickup point! Special Thanksgiving Market Day for Connecticut locavores seeking the freshest ingredients and prepared dishes from our favorite vendors! Is your latke making style nouveau or more like Bubby’s? Mail your favorite latke recipe to info@ediblebrooklyn.com by November 19. The winner will fry ’em up on December 10 at the Fourth Annual Latke Festival at BAM and win a Breville Scraper Mixer Pro Stand. Check out the tasty company you’ll be in and get frying! Learn about Leonardo’s Milan in 1495 and taste historically accurate foods and wine with Jane Tylus, NYU Professor and Italian Renaissance specialist, and Ross King, author, Leonardo and the Last Supper, 2012. Click here for info./tix. November 4, 2012- 2-4:30 at the 92Y Tribeca, NYC. Edibles prepared by 92YTribeca Executive Chef Russell Moss. Join Melissa Roberts for a hands-on cooking class highlighting ingredients sourced from the Westport Farmers’ Market. This 3 course Autumnal celebration will incorporate fruits and veggies that may not be on your radar yet. We’ll eat it together, and learn how to navigate the market and take advantage of the season’s bounty. Lunch will be kosher and vegetarian/dairy. Class is being held at 159 Kings Highway North. Click here to register. Community Plates is hosting a blowout of a party, on October 9, to raise much needed funds for their efforts. Check out their mission to connect surplus food from restaurants and other sources to food-insecure households in CT. Learn more and buy tickets here. Just in time for Sukkot, Prime at The Bentley is popping up on the rooftop! A 60 person Sukkah,with 360 degree views of Manhattan on the scenic UES, is Prime’s latest digs. Enjoy the views while indulging in tasty Kosher culinary treats including sushi, crudo offerings and Mediteranean fish straight from the charcoal grill. Open for breakfast, lunch and dinner. Street Fest Sunday, September 23, 2012, 12-5. Tong to tong contest at 1:00. Come taste the 3 top kosher grill recipes in NYC ! Celebrate the freshness of CT. farm fresh foods during Farm-To-Chef Week, September 16-22. Click here for list of participating restaurants. Among them are a couple of veg and raw favorites, including Bloodroot and Catch a Healthy Habit Cafe. Middle Eastern syncopation meets hip chick world music vibe as Batya Schecter and Pharoah’s Daughter comes to CT.
We’ll be re-thinking it and tasting it in advance of Rosh Hashanah. Mitchell Davis, James Beard Foundation, will moderate the panel of artisanal gefilte makers and chefs. Center for Jewish History, NYC. September 6 at 6 PM. Click Gefilte Talk for more info and tix. The Hazon Food Conference explores the intersections of Jewish tradition and contemporary food issues, with the goal of supporting leaders to create healthier and more sustainable communities in the Jewish world and beyond. This annual event brings together passionate people who are working for sustainable food systems in their own lives, communities, nationally and abroad. Come learn and be inspired! REGISTER now for pre-Labor Day discount. The Westport Arts Center winds up their Lunch-Escape series on the deck on 8/22, 12:30-1:30. Lunch is available, along with a convo about local producers. Join Dottie from Doc’s Organic Maple Syrup, along with Westport Farmers’ Market Manager, Lori Cochran Dougall, as they explore topics pertaining to organic and the local food scene. The First Annual World Kugel Day Festival will include a kugel cook-off and lots of tastings to the tunes of Rocky Mountain Jewgrass. Anyone who can attend at the Mizel Museum in Denver, AUGUST 19, 2-5 PM, please let me know! The 4th Annual Easton Farm Tour will take place on AUGUST 11, 10-3. Enjoy a self-guided tour to more than 10 farms and enjoy petting zoo, pony rides, tastings, farm stands and pick your own. Celebrate local! SONO Bakery owner, John Barricelli, will share baking secrets, and nibbles at the Westport Arts Center during their Lunch-Escapes series, Wednesday, August 8. The gathering meets on the deck, overlooking the Saugatuck River, 12:30-1:30 and it’s free. Consider buying his beautiful and thorough book, The Sono Company Baking Cookbook, and support your local bakery. Local chefs will serve up their most creative and freshest fare at the First Farm to Table Dinner at Wakeman Farm, Westport, CT, on September 15. Area farmers and vendors are donating the goods so that funds may be directed to continue implementing and expanding youth and community programming. Tix are on sale Friday, August 3 . Hurry! This is one party you will not want to miss. Hello Out There on the Left Coast! Herzog Wine Cellars presents another International Food and Wine Event at the winery in Oxnard, CA. A wide range of extraordinary wines will be paired with the best bites from the on site, highly acclaimed, kosher Tierra Sur restaurant. Buy tix for the August 2 event early and let me know how it is! The Gefilteria will take the Hester Street Fair by storm with their Old World Sampler Plate on July 28 and August 11, 10-6. These “purveyors of boutique gefilte and old world Jewish foods” are about more than just pickles! The Center for Kosher Culinary Arts (CKCA) will be teaching teens to cook, over 5 days in NYC. Session runs August 6-10 and will focus on technique, skill development and deliciousness, culminating in a cook-off to rock the UES. Check out their other offerings, too. I’m in love with these nut butter products! Jason’s is available in jars and single pack squeezables. They’re perfect for camp lunches and pocketbooks. And more: they’re Kosher, GF, vegan, dairy free, GMO free and delicious. Click here to find them. Learn about canning and preserving farm fresh veggies on July 14 as Sherri Brooks Vinton, author of PUT “EM UP, conducts 3 hands on workshops. All sessions are at Sport Hill Farm, Easton. Lunch will be catered by Chef Cecily Gans, The Main Course, LLC. Cost: $55. Register early. Tribes-A-Dozen has just released a product called: Voila! Hallah Egg Bread Mixes. Three varieties, Traditional, Wholey Wheat and Simply Spelt, will keep your guests guessing how you manage it all while spending the day at the beach. And it’s certified OU, parave. The Westport Farmers’ Market and Westport Arts Center are partnering on select Wednesdays this summer to present interactive workshops with local food, farm and gardening experts. Check WAC’s site to see the line-up. Lunch offerings by DuSoleil round out the mid-day break by the Saugatuck River. Don’t forget to visit the art gallery, too. Mark your calendars: June 27, July 11, July 25, August 8, August 22. You Shop. Westport Farmers’ Market Benefits. It’s a short season for New Catch Dutch Herring, the lightly cured, clean and briny treat available at Russ and Daughters in NYC. Down these small fillets with chopped sweet Vidalia onion and Cornichon pickles while imagining the pushcarts that sold them when our grandparents lived in the same neighborhood. Chef/Owner John Holzwarth presents plenty of great choices for veg lovers at the Boathouse Restaurant in Westport, CT. Check out this sublime salmon with a medley of beets, pea shoots, radishes, heirloom bean and kumquats. Local and Seasonal whenever possible. The view of the Saugatuck River, from the balcony, can not be beat. What makes honey taste like sweet and buttery blueberry blossom? Come learn and taste with Marina Marchese, local beekeeper and honey sommelier. Register for “A Taste of East Coast Terroir” at Red Bee Apiary, Weston, CT. on June 10, 1-3. I’ll be there! Brazilian Chef, Leticia Schwartz, will be teaching lucky Macy’s shoppers how to make Brigadeiro on June 7, @ 1 PM, NYC. Indulge in these fudgy chocolate treats while learning about Brazilian cheese bread and Caipirinhas, limey summer cocktails. Click to learn more about Leticia’s class offerings in CT.and NYC and her book, The Brazilian Kitchen: 100 Classic and Contemporary Recipes for the Home Cook. Sunday, June 3, 7:30 PM at the 92Y! Culinary historian, Alexandra Leaf says to expect “long established award winners and newcomers in celebration of the beauty and wonder of chocolate.” Unique pairings with wine and cheese will be offered, also. I’ll be there, for sure. Click here for more info. and tickets. Westport Farmers’ Market is opening for the season on Thursday, May 24 with an all organic and GMO free line up of farmers, small producers, local chefs and community service events. Meet your neighbors and your farmers as you shop and shmooze! Join culinary historian Gil Marks and writer and cookbook author, Leah Koenig in conversation about Jewish culinary history, holidays,and what’s cooking in the world of Jewish Foods. Click here for more info and to buy tix for this May 15 event at 92Y. Hanoch Bar Shalom, one of the first and greatest champions of using the freshest local ingredients found in Israel, has died. Read Liel Leibovitz’ beautiful essay about why he was so great. Syrian chef and author, Jennifer Abadi is teaching a 2 part vegetarian class focusing on the flavor packed regions of the Near and Middle East. Learn to make Syrian yellow squash pie with cucumber yogurt sauce and Turkish yogurt cake with semolina and lemon zest, among many other items. Class begins May 21 at ICE, NYC. Wesleyan University is gathering food bloggers and writers for Foodstock on Sat. May 5, 9-5. I’ll schedule around the breakout session called, “From lokshen to lomein: the Jewish love affair with Chinese food”. Presenters at the fest include Dorie Greenspan, Ruth Reichl, Jane Stern, Amy Bloom and other luminaries in the food universe. Chef Alexandre Petard has opened Ladino Tapas Bar and Grill in Columbus Circle, NYC. He’s offering Kosher, Latin fusion and waking up the ‘hood with bright flavors drawn from South America. Israeli company, Hishtil, has figured out a way to grow a basil tree that will live approximately five years. No more pining away for fresh basil in the winter. Read it here. Taste these beers on draft next time you visit your fave bar in Israel. http://israel21c.org/culture/israels-top-10-microbreweries. Article by Daniel Ben-Tal, photo: David Silverman. In this unique multi-sensory event, Israeli artists, chefs and producers explore a relationship to place through flavors, smells, and textures. An outstanding panel of speakers will explore Jewish Cuisines from around the globe, both traditional and contemporary: Tuesday, April 24, 2012 6:00 p.m. at the New School in NYC. Panelists include: June Feiss Hersh, author of Recipes Remembered: A Celebration of Survival; Michele Scicolone, expert on Italian cuisine and author of 18 cookbooks, including her most recent releases, The Italian Slow Cooker and The French Slow Cooker; Ted Merwin, professor of religion and Judaic studies, Dickinson College; and Naama Shefi, Israeli cuisine specialist and food writer. Val Vinokur, director of Jewish Studies at Eugene Lang College The New School for Liberal Arts, moderates. For more info click here. Let me know if you are attending so we can meet! Call to reserve your spot at a celebration of spring and freedom on Saturday, April 7.Three women chefs of different origins: Argentinian, Alex Raij, Mexican, Fany Gerson and Israeli, Einat Admony will join forces and cook a very unique dinner for the 2nd Seder of Passover, Saturday, April 7, 2012 @7:00pm (one seating). Balaboosta, 214 Mulberry St, New York, NY 10012. Call for reservations.Vegetarian options available if you are Kosher Like Me or veg. Notice must be given in advance. Click here to learn more about where to buy Israeli goods over this weekend. Put your money where your heart is! Join me, on March 26, 7:30-9 PM, as I present with other reviewers about what it takes to think and write like a critic. Click here for more info. and to register. Hope to see you there! Almost a week after Purim, bakeries in the Marais neighborhood in Paris are still selling delicious hamantaschen. I was tempted by these poppy laden treats in the window of Florence Kahn Bakery, founded in 1932. Are You a BBQ Competitor? First Annual Kosher BBQ Championship is being sponsored by Fairway Markets and will take place in Westbury, LI on June 10! All proceeds will be donated to L.I. based hunger relief charities. Team registration being taken now. Only 2 more weeks before Westport’s Farmers’ Market takes a hiatus and will re-open for the spring/summer. Check out the goodies this Thurs. March 8 and March 15 and then we wait….. Inside the Jewish Bakery, Recipes and Memories from the Golden Age of Jewish Baking by Stanley Ginsberg and Norman Berg, presents a collection of recipes woven with history and traditions of Eastern European Jews in America. My grandfather was one of these bakers! Tasted Tumbador hand crafted chocolate from Brooklyn while at the Public Theatre last night. They are rich, delicious and certified kosher, with a non-dairy, vegan selection too. Try the dark chocolate sesame raisin bar….. heaven. Jdeal is offering Gotham’s Kosher Wine Extravaganza for a great price. Spend Sunday, March 4, 3-6 PM tasting and planning your wine menu for Passover and other eves. Complimentary hors d’oeuvres will keep you from getting shicker if you forget to swish and spit! Check out this great offer. Alina Dizik shared thoughts on reconstructing treasured family recipes at www.wsj.com today. She lends great insights and reminds us that when experimenting with ingredients lists, heirloom recipes were generally uncomplicated and inexpensive to make. How true! Luna and Larry’s Coconut Bliss 100 % vegan and organic ice cream is heaven sent for those wanting dairy, soy and gluten free frozen desserts. Flavors like this Chocolate Hazelnut Fudge, Caramel Ginger Cookie and Mint Chocolate Galactica satisfy the most sophisticated palates. Luna and Larry’s Coconut Bliss via Hannah Kaminsky. Check out Levana Kirschenbaum’s compilation of recipes for all seasons. Bold flavors, simple ingredients and healthy attitudes come together in this exciting resource. This is a great gift for anyone who appreciates a wide range of multi-cultural recipes. Joey Allaham, owner of Prime Grill, Prime KO and Solo Kosher Restaurants in NYC opened Prime Butcher Baker on Second Ave. between 81/82 yesterday. The 3,000 foot KOSHER gourmet emporium features grass fed, organic meats, fresh fish via sustainable supplier LOCAL OCEAN, and a parave pastry kitchen on the premises. Welcome! Does February 14 get you down? Click link below, for Bon Appetit’s list of 10 mood boosting foods. Among them are some of my faves including dark chocolate, steel-cut oats and wild salmon. Note that they are mostly veg and all kosher…Not a coincidence! Monday, February 13 is the day to check out more than 30 kosher restaurants and caterers from the NY area at the Kosher Food and Wine Experience on Pier 60 @Chelsea Piers. Plenty available to drink too, with over 200 high end wines represented and available for sampling beginning at 6:30 PM. Go to http://www.kfwe2012.com/index.html to register. Hi. I’m Liz and I welcome you to Kosher Like Me. When I’m not caressing fruits and veggies at my local farmers’ market you’ll likely find me chatting with like-minded eaters, probing the scene in NYC or seeking inspiration in my spice cabinet. Life outside of this blog is all about my family, tasty travel adventures and power walks deep in the CT woods or along the shore. Please brew a fragrant cup of tea, grab a nosh and stay a while.